2. How Can a Stair Lift Improve My Life? 3. Will a Stair Lift Work On Any Stairway? 5. What Features Are Included For Stair Lifts? 1. What is a stair lift? A stairlift is a motorized lift that moves people up and down stairs. 2. Who needs a stair lift? Anyone who has trouble walking up and down stairs due to lack of strength, mobility, or confidence. A stairlift will allow you to stop worrying about using stairs and restore the freedom to move about your home. 3. How do stair lifts operate? All stairlifts share these basic components: a track, a motor, and a seat. The seat travels up and down the track and the motor moves the seat. All you have to do is sit down in the seat and use the hand control or remote to move up or down the stairs. In addition, every stairlift we sell comes with built-in safety devices to give you a worry-free ride. Manufacturer? - This is simply who makes the stair lift. We understand that our customers may have brand preferences and want to make it easy for them to find a stairlift they will be comfortable purchasing. We currently offer Acorn, AmeriGlide, and Summit brand stairlifts. Weight Capacity? - This is a measure of the largest person the stair lift can carry. The majority of stairlifts we sell have a weight capacity of 300 pounds. If you foresee anyone over 300 pounds using the stairlift then make sure to get a stairlift with an increased weight capacity. We offer stairlifts with weight capacities of up to 500 pounds. Battery Powered Stairlifts - These stairlifts are plugged into a household outlet which then charges a battery inside the lift. The motor in the stairlift runs off the battery. Stairlifts with a battery can be used even when the power fails, such as during a thunderstorm or when winter ice brings down power lines. They are also ideal in areas with frequent brownouts. However, if the stair lift will be used frequently, such as in commercial areas, then the battery may not be able to recharge quickly enough and will have a shorter lifespan. Electric Powered Stairlifts - These stairlifts are plugged into a household outlet and the motor in the lift runs directly off household power. They are ideal in cases where the stairlift will be used frequently throughout the day. However, the stair lift will not operate in the event of a power failure unless it has a separate battery backup such as a UPS. Cable Drive - Stairlifts with a cable drive use a steel aircraft cable that winds on a drum. As the cable winds on the drum, the seat moves up or down the track. Cable drives are a direct drive system which means that the cable does not move and so the cable never needs lubrication. However, the track will still require light lubrication once or twice a year. Rack & Pinion Drive - Stairlifts with a rack and pinion drive use a gear that runs over a track with teeth. This moves the seat up or down the track. Rack & pinion drives need periodic lubrication with grease and typically have circuit boards to control the motor which are prone to failure. However, circuit board controls allow the stair lift to have a soft start and a soft stop. Indoor or Outdoor? - Stairlifts for indoor use can only be installed in locations where they will not exposed to the elements. The majority of stair lifts we sell fall into this category. Stairlifts for outdoor use are made to withstand rain, dirt, and sunlight and can be installed outside. Need Foldable Arms or Seat? - Foldable arms move out of your way when you are trying to get into or out of the stair lift's seat. 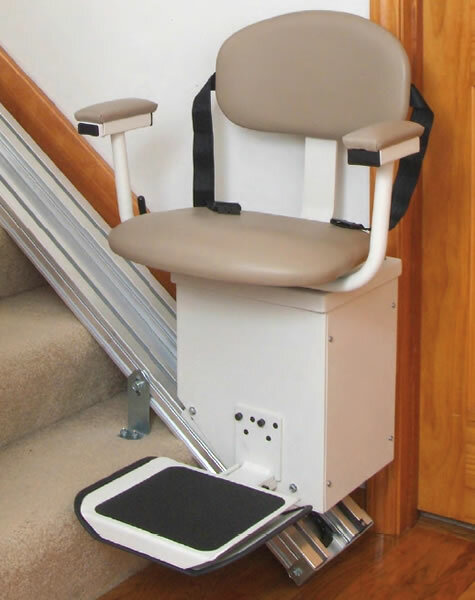 A foldable seat allows you to put the seat up when the stair lift is not in use. This gives you more room to use the stairs. With or Without Circuit Boards? - Stair lifts with circuit boards use circuit boards to control the power to the motor. This allows the stair lift to start and stop softly. However, circuit boards are prone to failure and are sensitive to static electricity. Stair lifts without circuit boards have motors that are directly powered. These stair lifts do not have a soft start/stop feature, but are more reliable.